Make restaurant reservations ahead of time and prepare or buy food to bring to the beach. To get to the beach at Praia da Bordeira you will have to walk about 10-15 minutes, depending on where you park. There didn’t appear to be a stroller path and you might have to wade through a stream. We carried our youngest in a backpack carrier. The older kids loved playing along the stream. Careful though, the sand can get hot. Get an early start in the morning so you have lots of time to enjoy the beaches. Plan to stay all day and enjoy a beautiful Portuguese sunset to finish out the day. We found the Algarve to have nice weather and few crowds during April (despite it being Spring Break). It can get quite hot later in the summer. 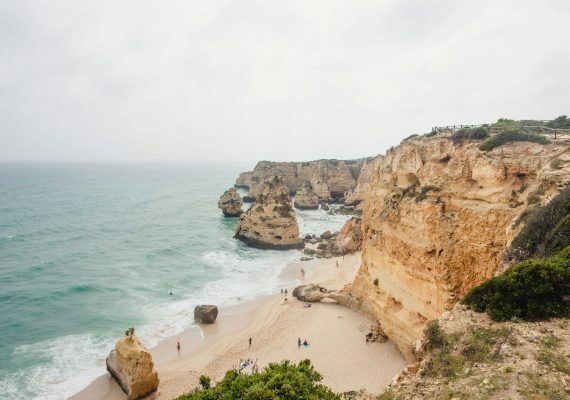 A coastal drive in this part of Portugal for kids and adults is an unforgettable experience, the views are incredible and the cliff-top hikes are amazing. Start the day by driving out to Cape St. Vincent to explore the most southwestern point in Europe. From Cape St. Vincent, make the short drive back to Sagres, which has a plethora of dining options. A Casinha, a restaurant featuring local dishes, won't disappoint. You’ll certainly leave with full, happy bellies. 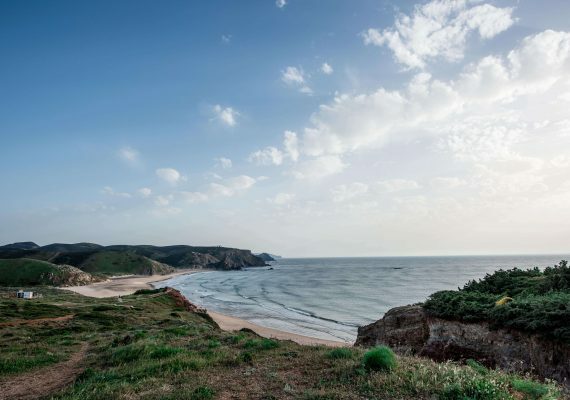 Next, venture out to Southwest Alentejo and the Vincentine Coast National Park. This national park is home to Praia da Bordeira, one of the coast's most beautiful beaches (20-30 minute scenic drive from Sagres). Your kids will enjoy hours in the sand, small streams and of course, jumping in the waves! Once you’ve had enough beach time, take the stunning coastal road, Estrada da Praia, to Praia do Amado. This beach is the home of the Algarve Surf School. Watch the surfers in the setting sun while eating ice cream purchased at the kiosk above the beach. 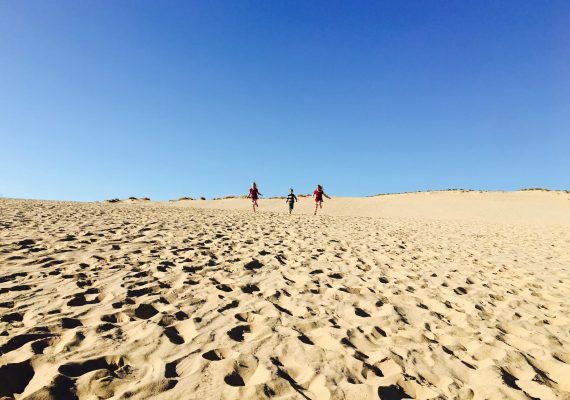 This itinerary along the southwestern point of Portugal truly offers the best family beach day in Portugal. Cape St. Vincent is Portugal's (and Europe's) most southwestern point. 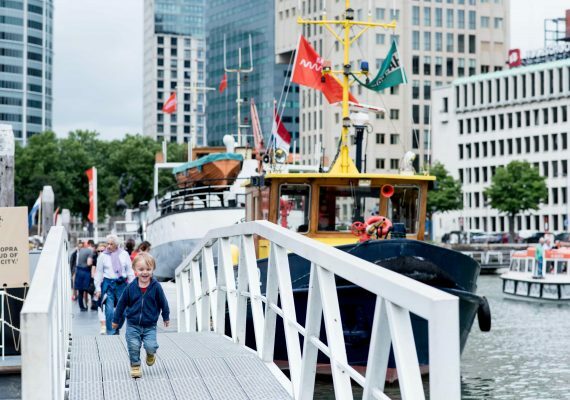 There’s plenty to explore including a lighthouse, a museum, gift shops and a café. We enjoyed seeing the views from atop the cliffs as we held on to our hats to keep them from blowing off! History buffs can study up on the history of the area (from the Romans, to the Moors, to early Christians). The scenery was very nice and there are good opportunities for photos. The kids also got a kick out of sitting on the giant chair that is available right there. TIP It can get quite windy. Parking during popular times and seasons could be an issue. Wonderful restaurant featuring cataplana, a local speciality of the Algarve. The restaurant is situated on the site of the owner’s grandparents’ home and our server was a member of the family who nicely explained to us how cataplana is prepared. My daughter loved her plate of giant mussels and my son was very pleased with his plate of shrimp! Our littlest, and pickiest eater, happily ate his plate of french fries. The grandparents and kids loved the freshly squeezed orange juice, as well. DIRECTIONS The restaurant is located at R. de São Vicente, 8650-327 Sagres, Portugal. TIP A Casinha opens at 12:30pm. Reservations are recommended. The beach is remote and more on the rustic side, featuring beautiful scenery. The waves were calm enough that the kids could play in them and the water, even in April, was surprisingly comfortable. Our favorite part was the river running into the ocean. The kids were delighted by the small fish they found and we could relax without having to worry excessively about the safety of our two year old. If your family is into surfing, one of the best surf schools in the area is located nearby. We saw lots of active surfers and it was fun to watch and dream about it for next time. DIRECTIONS From Sagres, drive toward Carrapateira. From there, follow the Estrada da Praia and signs toward Praia da Bordeira. TIP Parking is in a gravel lot and you have to walk a bit to get to the beach. Depending on where you park at Praia da Bordeira, you will have to take stairs or wade through a stream to get to the beach. There are no facilities there that we could see. Incredible drive from Praia da Bordeira to Praia do Amado along the Estrada da Praia. The road hugs the coastline and offers dramatic views of the ocean and cliffs. There are also lookout points with parking available. DIRECTIONS Drive from Praia da Bordeira (near Carrapateira) to Praia do Amado. TIP The road can be a little rough at points. Designated lookout points are a great place to get out with the kids. Use caution on high, unprotected cliff walks. Praia do Amado is a large, sandy beach on the Atlantic coast. This beach is popular with surfers and the Algarve Surf School can be found here. If you're feeling hungry, there's a small snack shop near the parking lot. From there, take the path (with stairs) down to the beach. The path is not accessible with a stroller so be prepared to carry your children and gear down to the beach. I recommend getting an ice cream and heading down to the shore to watch the sunset.